Rumour No. 1: Manchester City target Maicon is on the verge of joining former manager Jose Mourinho at Real Madrid, after agreeing a £25 million deal ‘in principle’ with the Spanish giants. It is though the Inter Milan right-back, who is currently on World Cup duty with Brazil, will complete his move to the Bernabeu as soon as he returns home from South Africa. “Premier League football attracts me and the way [Manchester] United play football attracts me. You think about being Wayne Rooney’s strike partner and that is very attractive for any striker. The Best of the Rest: Manchester City have returned with a fresh £18 million bid for Lazio’s Serbian right-back Aleksandar Kolarov. Inter Milan have refused to meet Liverpool’s £30 million valuation of Javier Mascherano, after seeing a €20 million offer rejected for the Argentinian holding man. Everton manager David Moyes is desperate re-sign US star Landon Donovan on a permanent deal, after the L.A Galaxy winger’s impressive displays at the World Cup. Fulham are tracking L.A Galaxy’s 29-year-old striker Edson Buddle. West Ham have cooled their interest in Juan Roman Riquelme as the Boca Junior’s midfielder is demanding over £50,000-a-week in wages. Lazio are hoping to seal an £8 million double swoop for Portsmouth pair Nadir Belhadj and Kevin-Prince Boateng. West Brom are in talks with Sunderland’s reserve ‘keeper Marton Fulop over a move to the Hawthorns, although the Baggies may face competition for the Hungarian stopper from both Anderlecht and Olympiakos. Hull City have given midfielder Jimmy Bullard permission to talk to Celtic over a possible twelve-month loan deal. 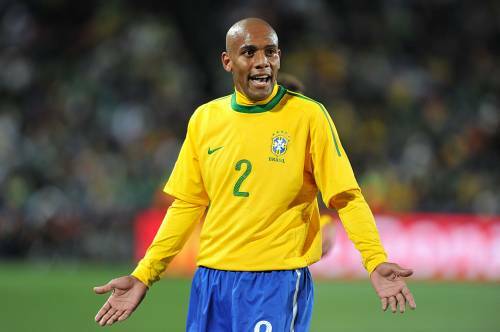 what the hell do real madrid need maicon for? sergio ramos?? ?